I'm not wild about dessert beers. But my girlfriend isn't wild about beer in general. So, when she expresses an interest in any craft beer, I'm always happy to buy a bottle with the hopes that we'll find something she likes. 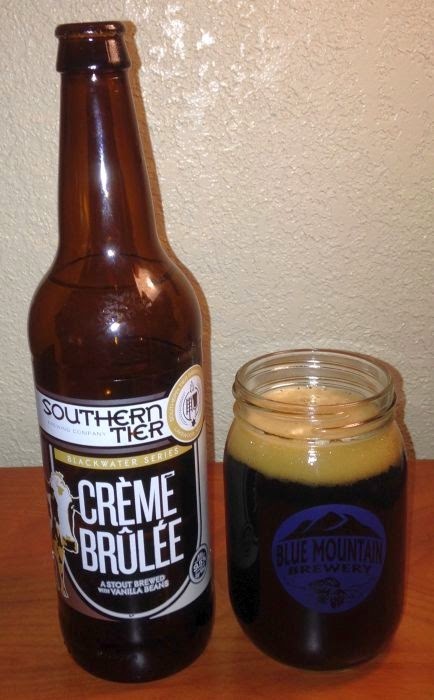 She said that she thought that Southern Tier's Creme Brulee Stout sounded yummy, so I got us a bottle. It was, for us, an ideal beer; she loved it, and I liked it a lot more than I usually like the sweet stouts. This stout pours dark brown to black, and the thin head fades to a rim with just a little bit of lace left in the glass. The aroma was boozy, with butterscotch, vanilla, rum, and raisin notes coming through strong. The flavor was sweet, but even boozier than the aroma (not really any surprise at almost 10% ABV). The flavor added bitter notes, coffee and licorice to the aroma, and the finish was surprisingly strong. Dessert beers sometimes wear out their welcome with me. This one didn't. My girlfriend and I ended up competing to finish this off. There haven't been a lot of beers that she and I both thoroughly enjoy, but Creme Brulee Stout by Southern Tier made us both happy.